National home prices have increased by 6.7 percent year-over-year. 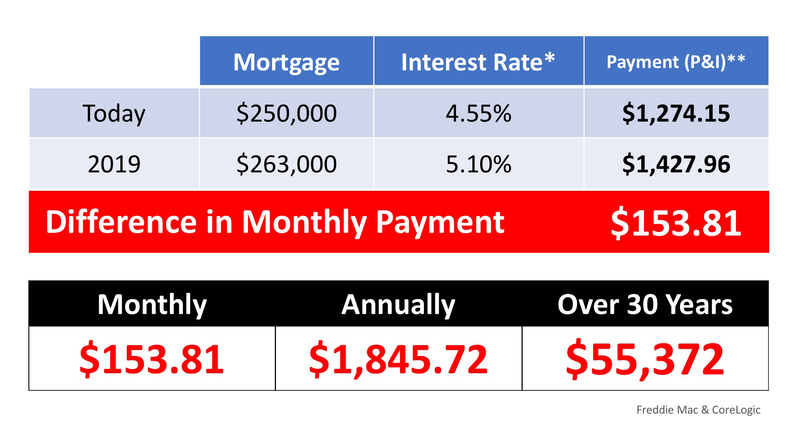 Over that same time period, interest rates have remained historically low which has allowed many buyers to enter the market. As a seller, you will likely be most concerned about ‘short-term price’– where home values are headed over the next six months. As a buyer, however, you must not be concerned about price, but instead about the ‘long-term cost’ of the home. The Mortgage Bankers Association (MBA), Freddie Mac, and Fannie Mae all project that mortgage interest rates will increase by this time next year. According to CoreLogic’s most recent Home Price Index Report, home prices will appreciate by 5.2 percent over the next 12 months.